In November 2005 I went to Pembrokeshire wto look at Neolithic tombs under the guidance of archaeologist George Nash. 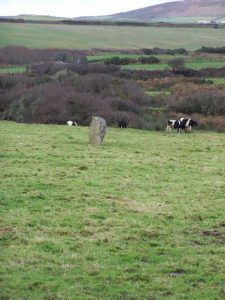 Throughout Pembrokeshire there are standing stones, some erected in modern times as rubbing stones for cattle or sheep. 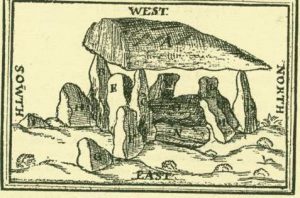 There are also clusters of tombs – portal dolmens with a single chamber (like the Hoar stone in Enstone, Oxon), double dolmens with two chambers probably later in time, earthfast tombs with one side of the capstone anchored in the earth. Many of these – perhaps not the earthfast type – had mounds of earth or small rocks over them. The capstone may have protruded from the top of these. Some portal dolmens were incorporated into long mounds with a tail and with forecourts. 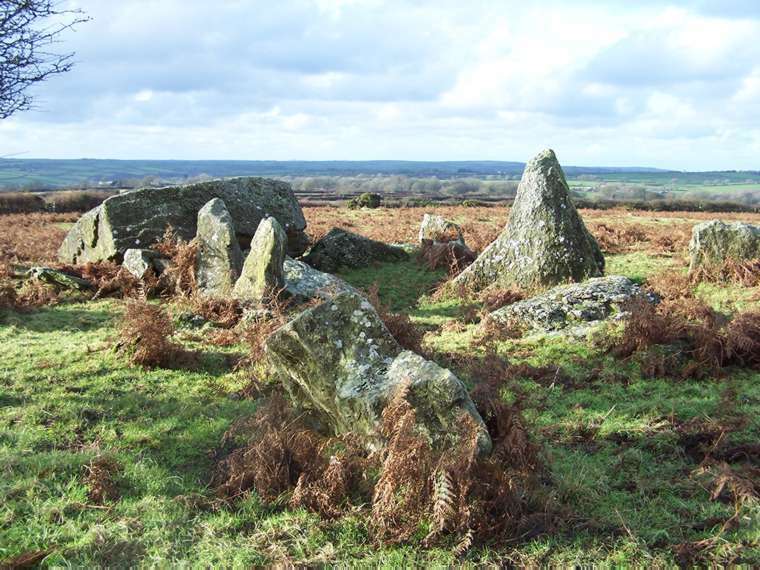 Though the forecourt “horns” are shaped (though not constructed) like the long barrows of the Cotswold Severn area (like Belas Knapp in Gloucestershire), there are other differences in design. Exact dating is difficult but these are generally ascribed to the Neolithic age. There are few reliable remains to date. Even human bones, which can be dated, may have been placed in the monument later. 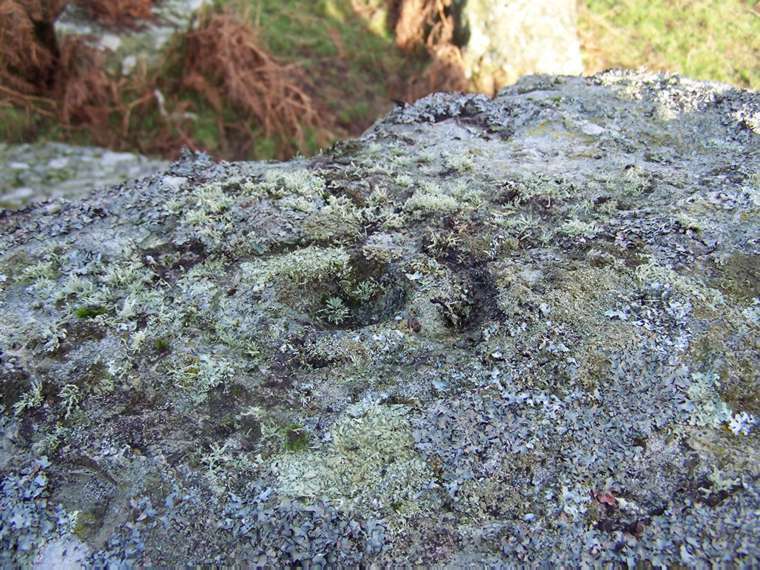 Cup marks found on the monuments would have been added later in the Bronze age. 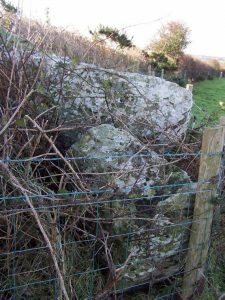 Folklore in Pembrokeshire ascribes these monuments to local saints or King Arthur, rather than the Devil. 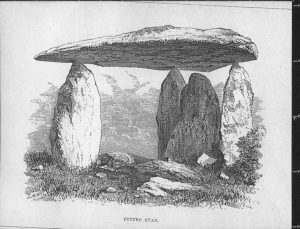 And the Welsh romantics of the eighteenth and nineteenth century claimed that they were bardic or Druid altars rather than chambered tombs. 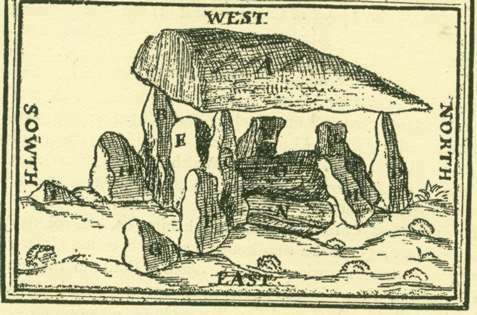 Many of the early antiquarians could not believe that Neolithic man would have covered up the dolmens, erected with such difficulty, with earthen mounds. 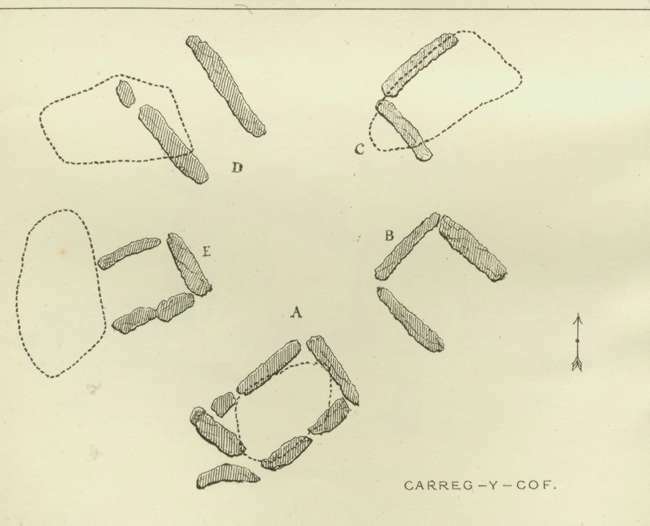 The line drawings come from the Archaeologia Cambrensis 1872, unless otherwise stated. 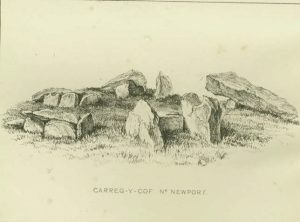 I have followed George Nash in “Neolithic Sites of Cardiganshire, Carmathenshire and Pembrokeshire” (Logaston Press) in grouping these geographically. But within each group I have ranked them in alphabetical not geographical order. Twic-y-Filliast, Llngynog, SN 3383 1608. 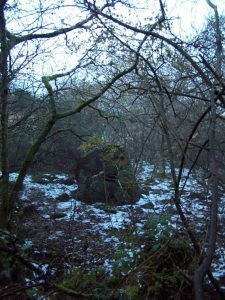 Also called Arthur’stone or Ebernezer, Hidden in bushy woodland, just off a footpath and footbridge over a stream, this is a much damaged site. A amulet discovered nearby may date the monument to the late Neolithic early Bronze age. Probably a portal dolmen with one small chamber, three upright orthostats and a slipped capstone. Archaeologist George Nash detected some stones, which might suggest a passage with a façade. 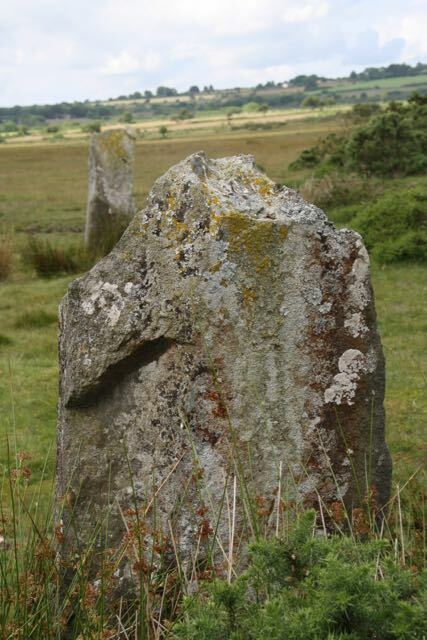 A row of three large upright standing stones made out of puddingstone, a conglomerate of pebbles stuck together with silica and lion oxides, in the church along the B4293, south of the village. 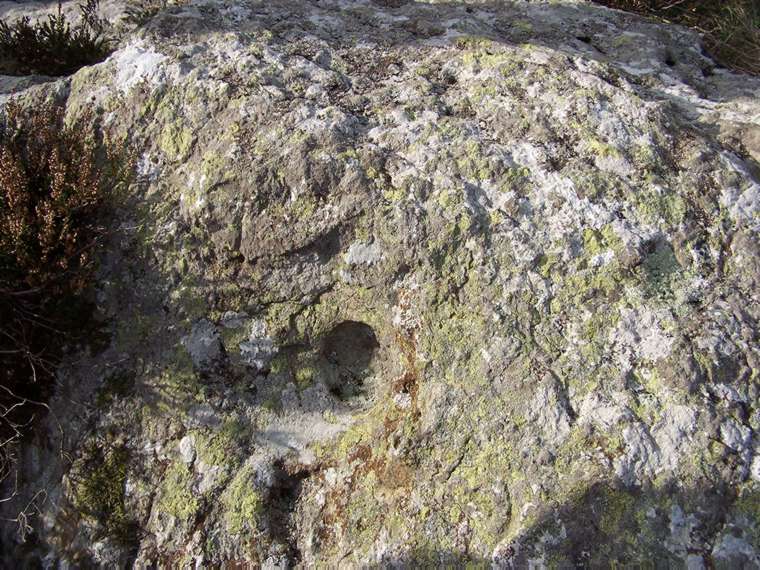 The village itself is named from the stones – tre – three, lech – stone. 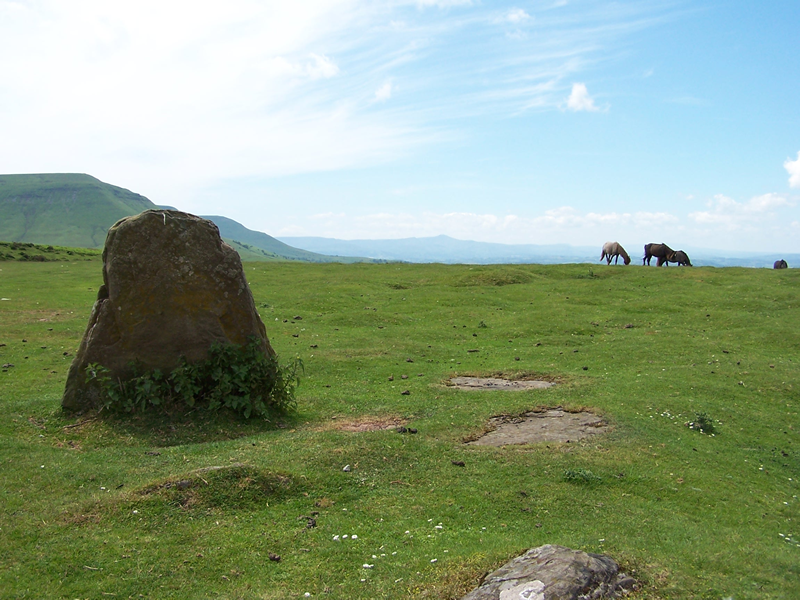 They were supposedly erected to commemorate a victory by King Harold, but are prehistoric. 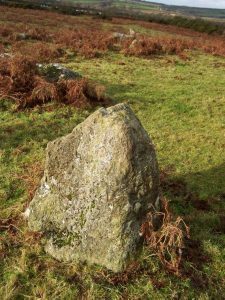 Another tale is that A folklore tradition tells how they were thrown down by a giant, Jack of Kent, from the nearby Sugar Loaf mountain when he was playing quoits with the Devil. Folklore says that if you pull out one of the small stones from the puddingstone, it grows a new one. If you walk back from Harold’s stones, you come to the little drinking trough which marks the Virtuous Well at the crossroads towards the village. Turn into the village and there is a little waymarker stone in the lane on the right. This is the other side of the garden wall of Hollytree House. 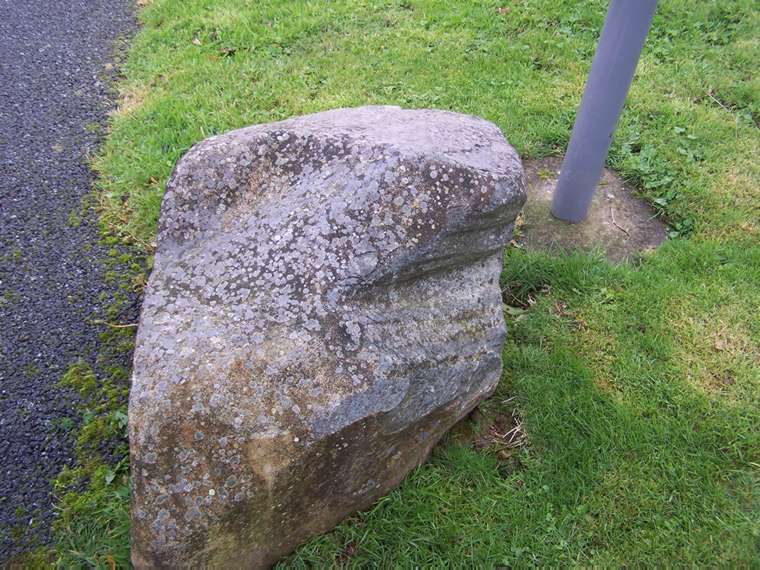 On the village “green” (a green without grass) is a mounting block of stone – is this the Mounting stone shown on the Explorer OL14 at SO 504102, saved by the Friends of Trellech. 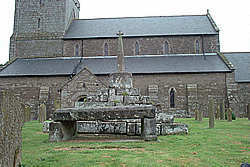 And in the churchyard is a whacking great Saxon altar stone, as well as a fine medieval cross. A much damaged chambered tomb. Some of the monument is probably still in the hedge boundary. 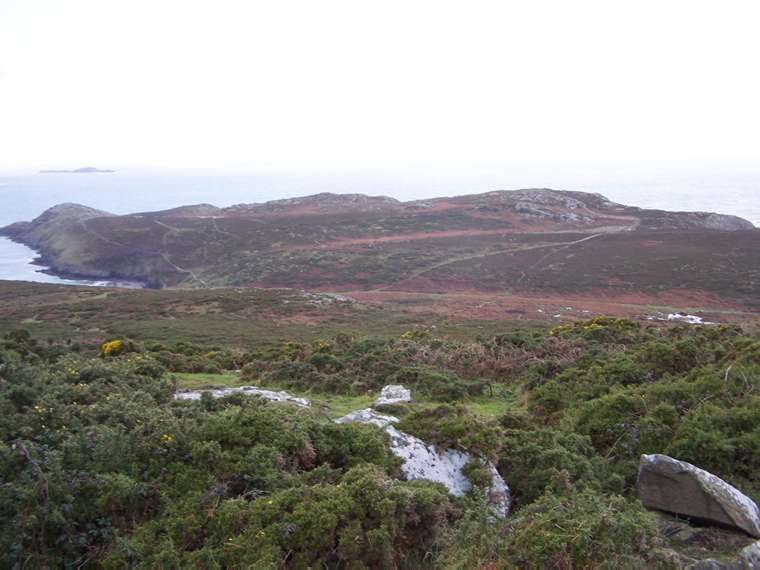 Archologist George Nah suggests this, Parc yu llyn and Garne Tune may be by late Neolithic, c. 2500 BC. This could do with some wire or fencing round it to reduce cattle damage. 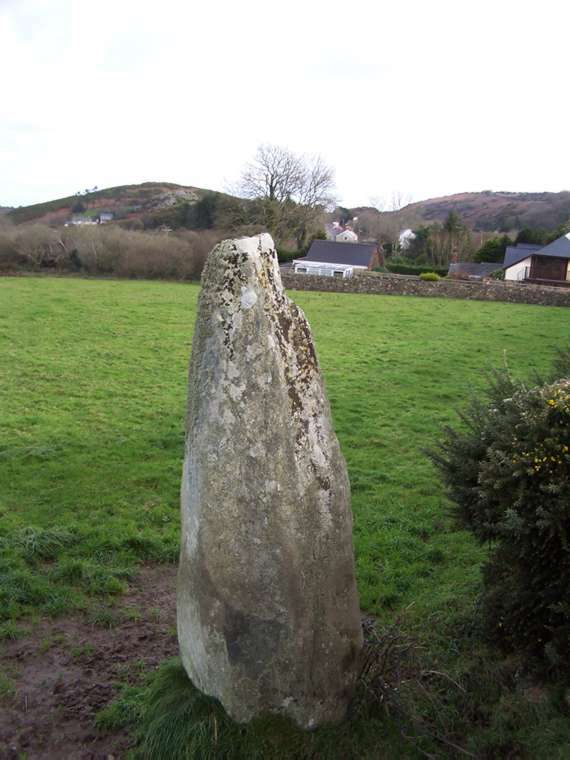 A large capstone on three legs like a tripod which dips towards the Afon Nyfer estuary. Also known as Arthur’s Quoit. 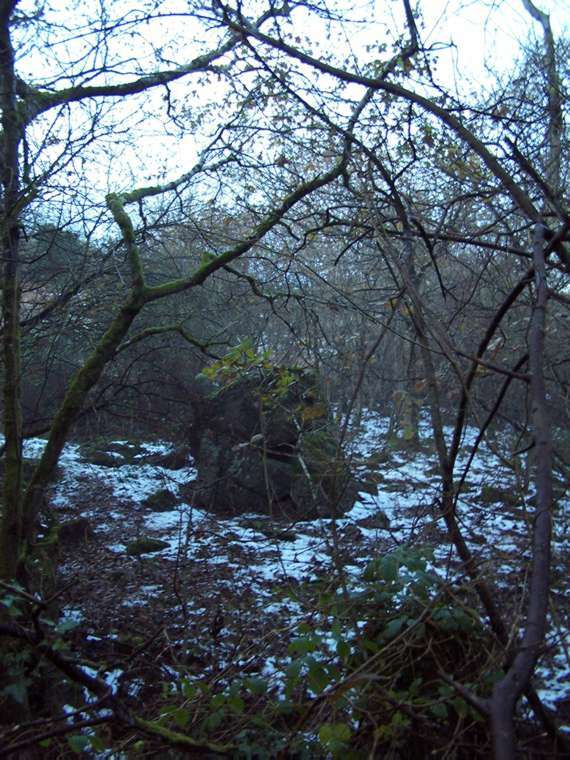 The site is railed off(why do people think dolmens need caging?) 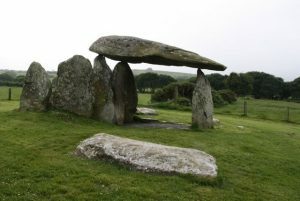 and surburbanised by nearby bungalows and caged in by railings, as if dolmens were zoo animals! 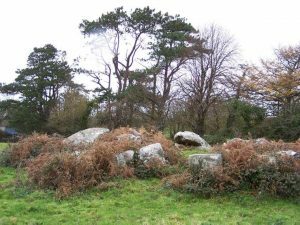 Nash describes is as a classic portal dolmen once incorporated into a long mound. There are still traces of this mound. 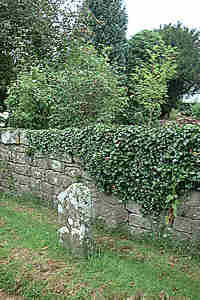 When leaving the dolmen on the right of the tarmac drive, next to the “Private road” sign, was a small polisher stone. It may now have disappeared, possibly into somebody’s rockery. 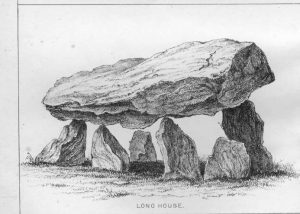 There were remains of its earth or stone coverings visible in 1872 according to the Archaeologia Cambrensis of that year – vol 3 Ser.4. p 140. 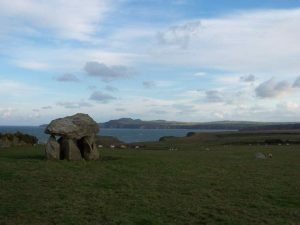 A double chambered tomb looking out towards a Neolithic settlement with field systems still visible. George Nash thinks this was unlikely to have had a covering mound. The west capstone is of the “earthfast” type, with one end resting on the ground. There is a theory that the other capstone once rested on a ledge of rock. This tomb nowadays, and possibly always, merges into the rock hillside so that it is, unlike many monuments, invisible from afar. A concrete gun emplacement, built during World War 11 just near this tomb, is still visible. 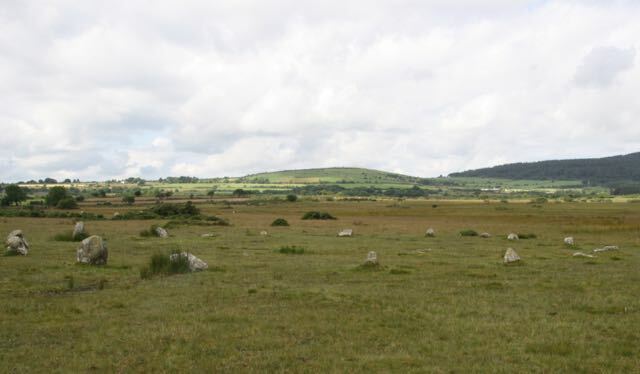 On the way back from here to St David’s town various erect stones are visible from the entrance to Emlych farm. 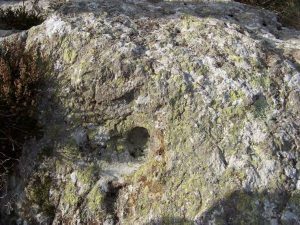 So called since it was thought that St Samson lifted the capstone with his finger. This was a portal dolmen probably incorporated into a long mound. The outlying stones are just outcrop. 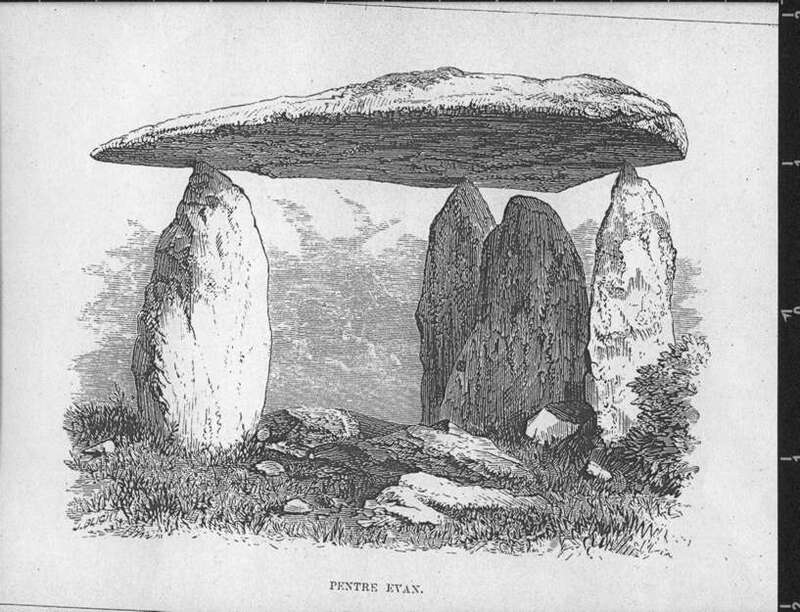 Like other portal dolmens, the stones were erected over a pit now filled in. 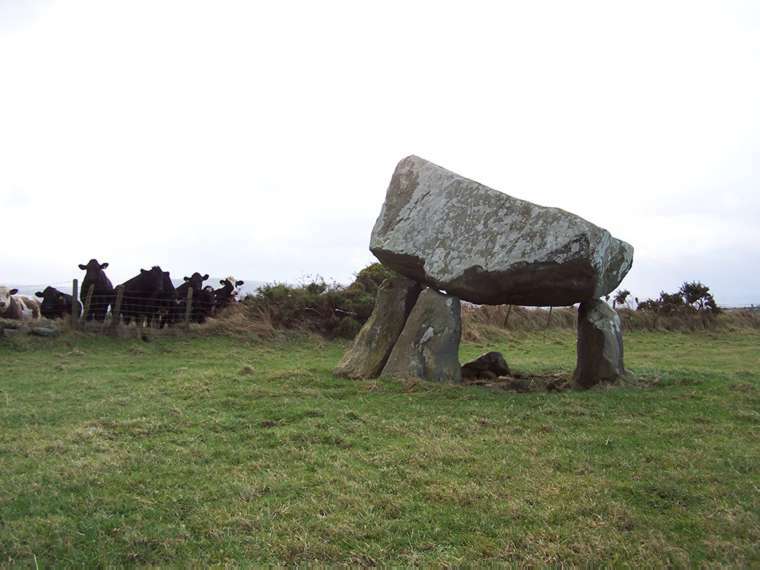 At one stage the monument may have had dry stone walling – possibly because it was used as a sheep shelter. Excavations in l968 found an early Neolithic bowl. Of great interest to archaeologists, this tomb has five small burial chambers (cists) radiating out from the centre of an oval mound. 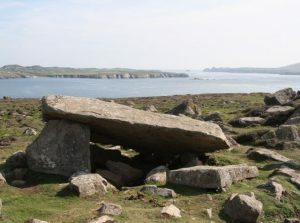 George Nash suggests this tomb may show the transition from Neolithic to Bronze Age tomb design. 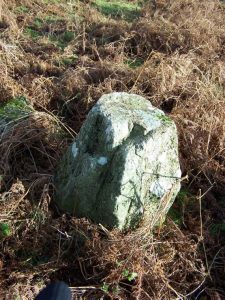 An outlying stone, not necessarily an erected one, at SN 0357 3892 is cupmarked. We are lucky it still survives. 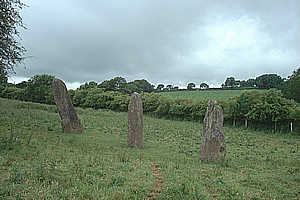 In l853 an antiquarian vicar, the Rev H. Longueville Jones reported: “Five cromlechau arranged like the radii of a circle.. all cleared from the surrounding stones and earth; the tenant is very anxious for their removal, .. the probability, therefore, is that within a few years a new wall will have been added to the field, but that this almost unique monument will have disappeared.”(Arch Cambrensis 4, p 276). 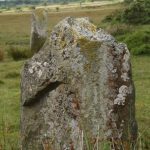 By l872 the journal reported that some of the stones had been removed. The l872 plan and line drawings are easier to follow than my more modern photos! and one flat topped at SM 97904 27307. 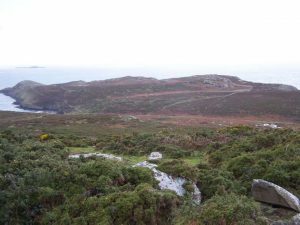 This major prehistoric site, on the headland looking down to Goodwick bay, is living proof that some planning officers don’t give a damn about these monuments. 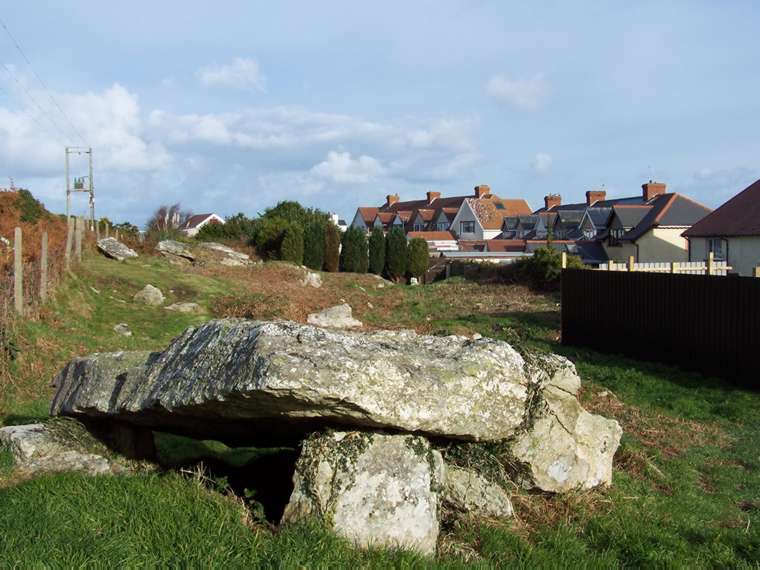 This is an amazing linear cemetery of three, maybe once five, megalithic tombs but a row of seaside houses has been built only a few yards away. The tombs could look out to the sea if it wasn’t for these houses in between! Gardens are now intruding upon this cemetery. 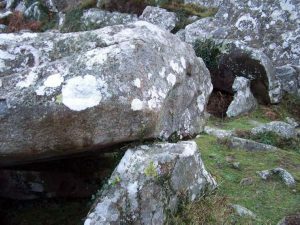 It is difficult to know if these are portal dolmens with slipped capstones or earthfast capstones with one end in the soil. 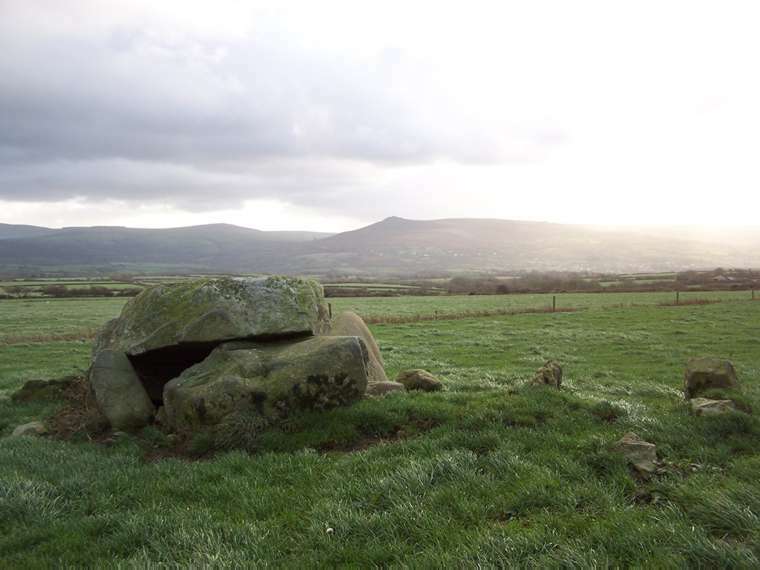 There is no evidence of covering mounds and the tombs blend into the rocky outcrops. Up the hill are natural rocks including a cupmarked one at SM 9482 3904. Easy access by footpath. 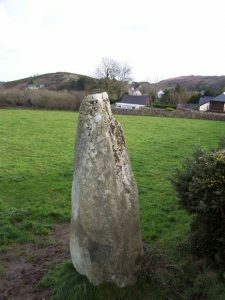 A single standing stone, railed off the A487 Fishguard to Newport road. A processional marker? Said to resemble a cloaked woman. 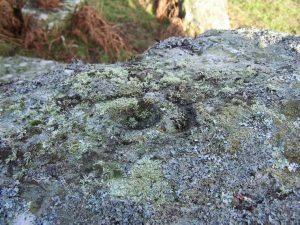 The name of the Lady may mean Our Lady, a Christianised name for an earlier stone. In a field off a rough track towards Penland Farm, this looks like a tripod. 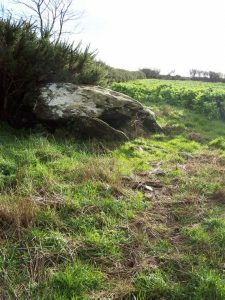 A fallen stone may have once been the fourth to hold up the huge capstone, which almost seems too large for its supporting stones. 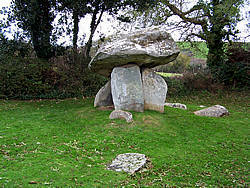 Also known as Samson’s Quoit or the Altar stone. 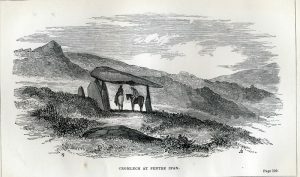 In 1613 in The Description of Pembrokeshire, George Owen of Henllys (1552-1613) reported: “There are other stones in iij or iiij other places in the country adjoining (to Pentre Ifan) as Legh y tribedd near Richardstone and one in Newport near the bridge, another beneath the town but not comparable to this, neither in bigness or in standing so high.” The l872 line drawing is from the opposite angle to my photo. This has become incorporated into the field bank at the end of a green lane (wired off), which turns to become a footpath. A tempting site for archeologists as the earth banks have probably protected whatever remains in the tomb. 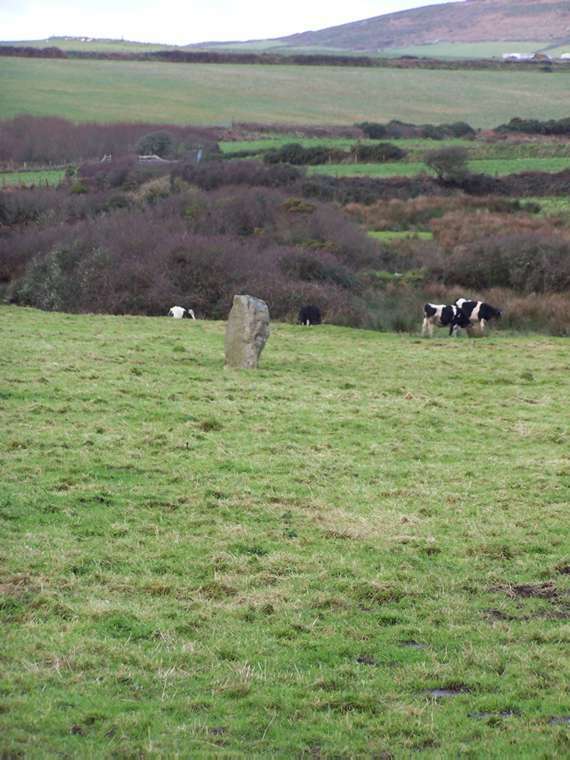 The standing stone right in the middle of a nearby field may be linked or it may just be a rubbing stone for cattle. 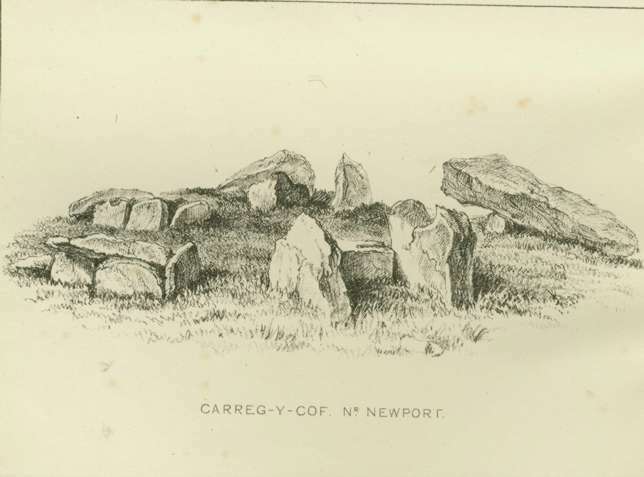 This tomb would have been visible from Carreg Sampson and probably looked like Llech y Dribedd. A smaller monument not far from Garn Turne on private land. 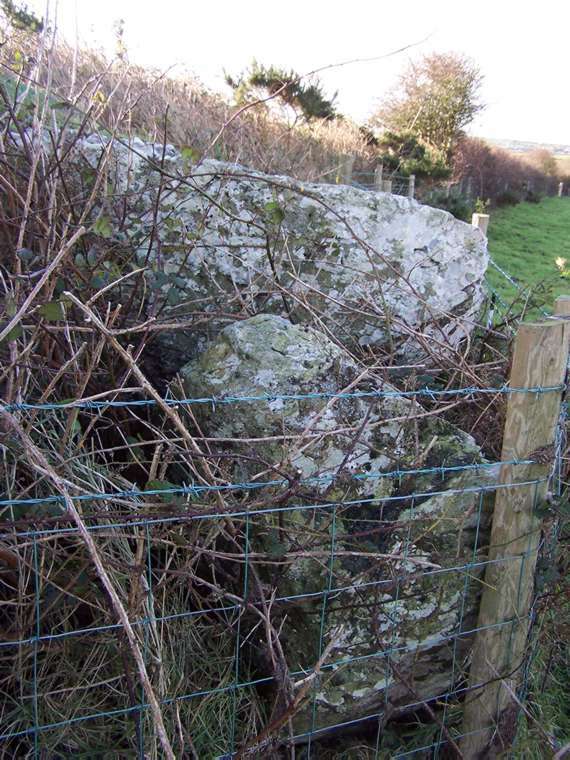 The collapsed capstone is close to the banked hedge, which may enclose a second chamber. 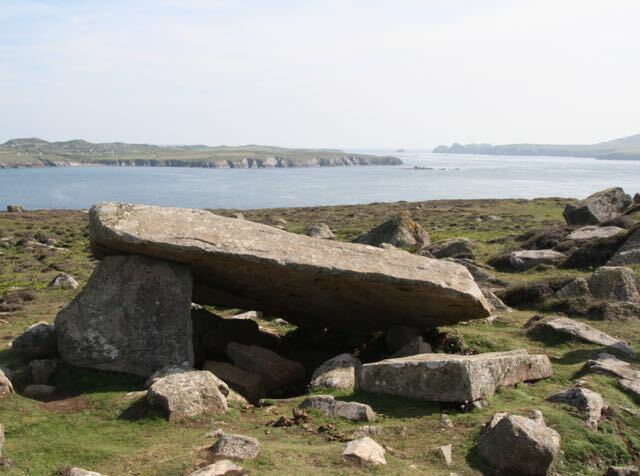 This kind of monument doesn’t look much to outsiders but it offers archaeologists the chance to find unexcavated and unplundered tomb material in the future. 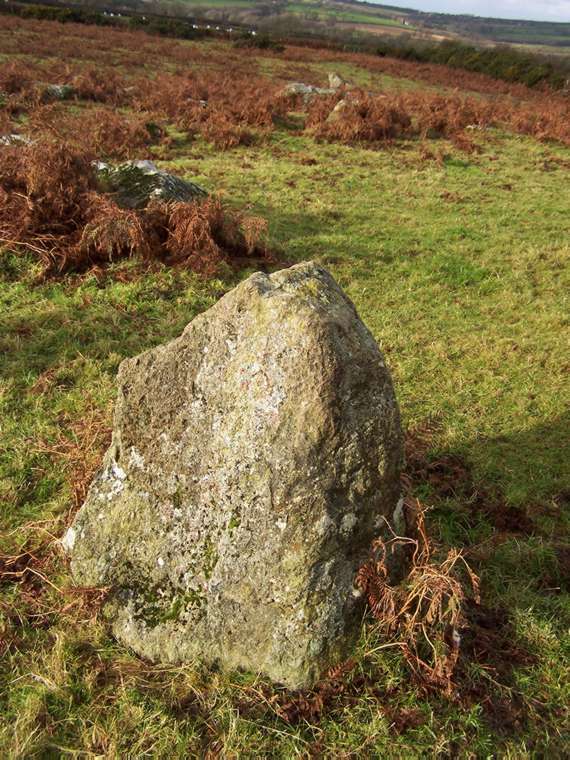 Like Stonehenge in England, this is a Welsh megalithic icon, on the tourist map from the seventeenth century onwards. 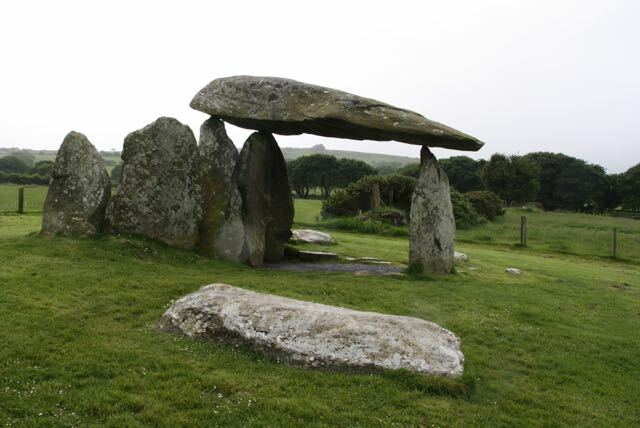 It is a closed portal tomb with a single burial chamber. Below the capstone, the tomb’s chamber was originally cut into the earth and lined with dry stone walling. 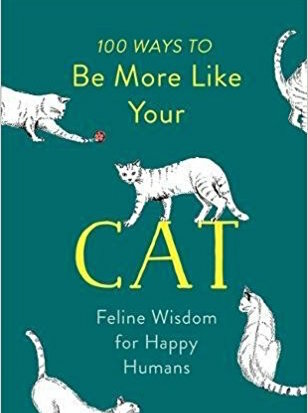 This has now been filled in. 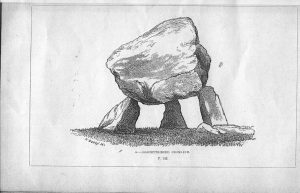 Like a Cotswold long barrow (see Belas Knapp Gloucestershire) it had “horns” erected either side of the entrance, making a forecourt area, and a stone in the middle of the entrance, not in contact with the capstone. This acted either to block entrance into or if moved to allow entrance into the tomb’s chamber. It looks rather like Cotswold Severn long barrows to me, but is generally thought to be influenced by Irish Carlingford tombs. This huge monument would have been covered with stones and earth, like a long barrow, though possibly with the large capstone showing at the top. 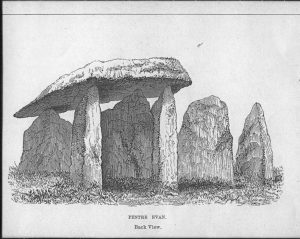 Nineteenth century archaeologists had great difficulty in believing that these monuments were covered by earth or stone cairns. Brittanica in its 1695 edition. 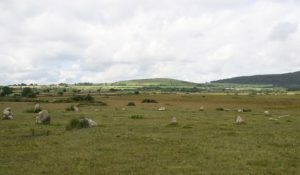 In the adjoining field are some stones that look like standing stones. 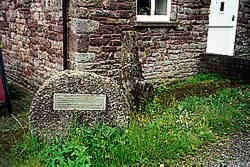 A local vicar, with the bardic name of Tegid, in the nineteenth century claimed one of the fallen ones was a bardic alter! People read their own culture into antiquities and no doubt our modern interpretations will seem quaint in a century or two! The builders used two kinds of stone and there are cupmarks (disputed) on the capstone. There may once have been dry stone walling between the uprights. The name apparently means Toad’s Hall and a medieval Welsh historian claimed that a chieftain buried inside the tomb had been eaten by toads! 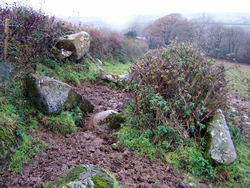 No footpath – you need permission from Trellyffant farm to visit this. Just over the Wales border in Powys. Worth going to see if you are visiting the Michaelchurch Escley sites. Marked as stone circle on the OS map and sited next to a car park on a minor road from Hay-on-Wye to Llanthony. 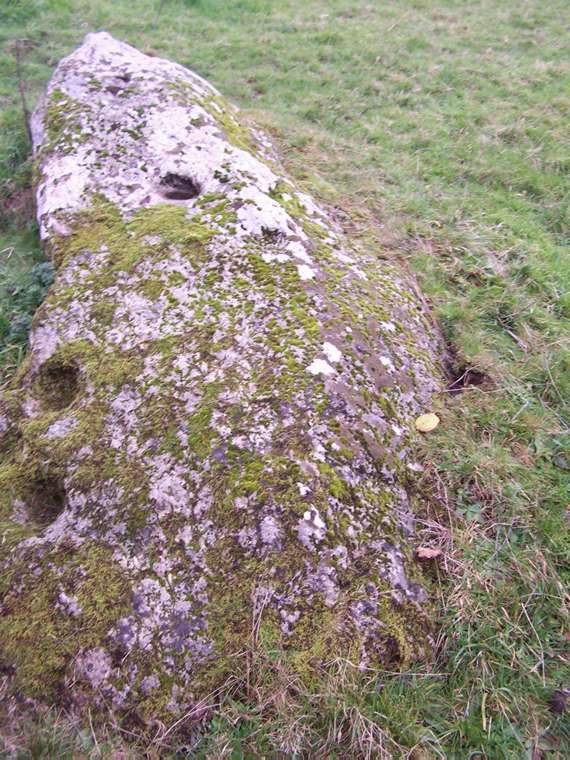 Only one erect stone, about 1.5 m high with smaller stones lying nearby and a few opposite. Underneath an OS mark there’s what is thought to be a cupmark. The ground is uneven so it is difficult, if not impossible, to see how the circle may have gone. There’s a boulder put there by park authorities to stop people driving over the site.